Cunard's fleet of "Queens" - Queen Mary 2, Queen Victoria and Queen Elizabeth 2 - lined up for the historic meeting at about 1800 BST. 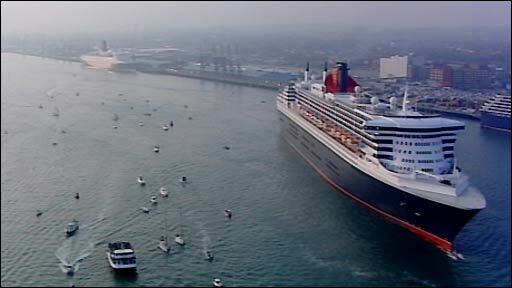 The QM2 and Queen Victoria then left port shortly afterwards, leaving the QE2 in dock. The QE2 will retire in November when it will be converted into a hotel in Dubai after more than 40 years in service. The Queen is making a farewell trip to her namesake in June before it sets sail for the United Arab Emirates. It will be the third time the Queen has visited the QE2 since she named it at Clydebank, Scotland, in 1967. During its 41 years at sea, the 70,000 tonne ship has travelled more than 5.6m nautical miles, carried more than 2.5m passengers and has also been used to transport troops and host royalty. The historic meeting of the three luxury cruise liners on the south coast comes three months after the ships met for the first time in New York in January. The earlier encounter was believed to have been a one-off in Cunard's 168-year history but a change in the QE2's schedule met they have all met again for the first time in their home port.